10 beautiful fall-colour views of the Edmonton river valley like you've never seen before! With the fall colours in full bloom in Edmonton, we’ve created a series of 10 aerial panoramas to show off this beautiful city! Enjoy some unique and beautiful panoramic views of Hermitage Park, Rundle Park, Dawson Bridge, Downtown Skyline, Alberta Legislature, Groat Road, Hawrelak Park, End of the World, Fort Edmonton, and Legion Memorial Ball Park! Tap here for the mobile/tablet specific virtual reality version! Computer – Click on the image, and drag your cursor around to explore each view in 360 degrees! Alternatively, use the arrow keys or the directional arrows at the bottom of the panorama to move around. Select a different location on the google map, or on the slider that appears when you mouse over the bottom of the pano. And be sure to click on the full screen icon in the bottom right hand corner of the pano to get the full effect! Mobile – For a truly unique experience, load this up on your mobile device such as an iPhone or iPad, and watch your views change as you physically move your device around! This is virtual reality from an aerial perspective! 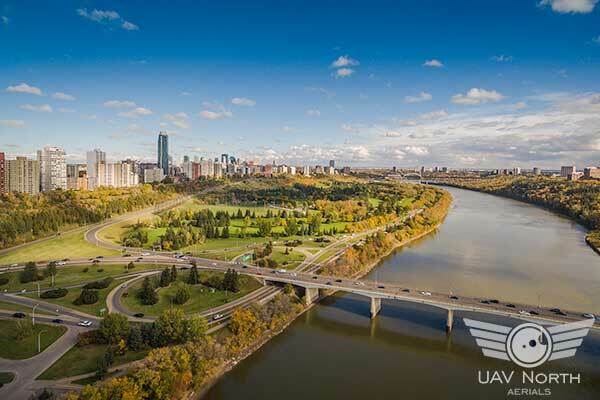 We flew our drones high above the North Saskatchewan River to capture these amazing 360 degree views of our beautiful city! Just think, before UAV North came up with this idea, views like this would have been impossible! You’re welcome! Over the years of producing awesome aerial photos and videos for our clients, we got used to seeing the city from an aerial perspective. Once all the trees started changing colour in the fall, we thought this would be the best time to share our beautiful views with you! If you look straight down in each pano, you can see that they were shot right over the middle of the North Saskatchewan River, at various points of interest throughout the city of Edmonton. Oh yeah, there is also a bonus location over the Sturgeon River in St. Albert for you to enjoy! Well, these 360 panoramas are just really cool! What an awesome way to show off the fall colours in Edmonton!